The kingmakers in Prampram in the Ningo-Prampram District in the Greater Accra Region of Ghana have successfully installed a new paramount Chief for the traditional area. The new chief, Nene Tetteh Waka III, was yesterday taken through the customary rituals of the area to signify his installation. He was later taken through some principal streets in the area in a palanquin. A mini durbar was subsequently organized at the forecourt of the Royal Annorwey Family House where the new chief delivered a short speech. Nene Tetteh Waka III entreated all natives of Prampram to come together to develop the area. Police officers from the Tema Region were deployed to assist Prampram Police to provide security during the ceremony which ended peacefully. The Prampram has been without a substantive chief for years following the death of the previous chief of the area. Immediately after the death of the late Paramount Chief, Nene Tetteh Djan III, there were several attempts by some people to install a new chief which resulted in disagreement. The Mankralo and acting President of the traditional area was shot dead by some unknown assailants at Appolonia in the Kpone-Katamanso District of the Greater Accra Region in December last year. 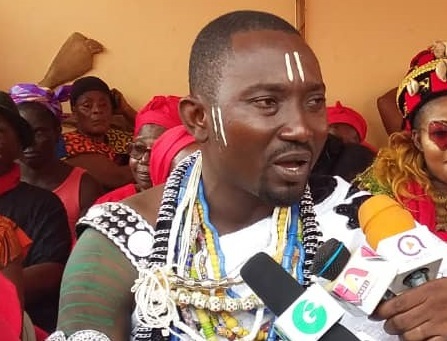 Nene Atsure Benta III was shot in the head and rib by the armed men at an intersection at Appolonia while on his way from a meeting at the Greater Accra Regional House of Chiefs at Dodowa. He was found dead in the driver's seat in his Mercedes Benz car with registration number GT 6618 T.